Spending money on public services requires tough decisions and a robust understanding of the costs and benefits. Cody Xuereb, Economic Adviser at the Department for Communities and Local Government (DCLG) and Rory Moody, Policy Adviser at the Cabinet Office, explain how a suite of new tools can help. One of the challenges of government departments working together is how to make choices about allocating budgets when there are so many competing priorities. Faced with reducing the deficit by half to £38bn by the end of 2014-15, government has to make transparent decisions around which services will deliver the greatest value and benefit. That means when pitching proposals to government, any local authority or voluntary organisation must back them up with a robust cost-benefit analysis (CBA). Something that would make this process far more efficient would be a way to estimate a unit cost for delivering a service. Imagine, for example, if you could show the average unit cost per person engaged in effective drug treatment, or the average annual cost of a child attending a pupil referral unit. This unit cost would show the expenditure incurred for providing one unit of a service, enabling government departments and local authorities to assess the value of proposals to restructure or expand such services. To address this challenge, DCLG, the Public Sector Transformation Network, New Economy Manchester and a number of other departments have come together to produce an innovative appraisal toolkit to help teams come up with a cost-benefit analysis and access a repository of unit cost data. The toolkit, launched earlier this year, is already providing a common basis for making and appraising the case for public service transformation across a number of different areas. 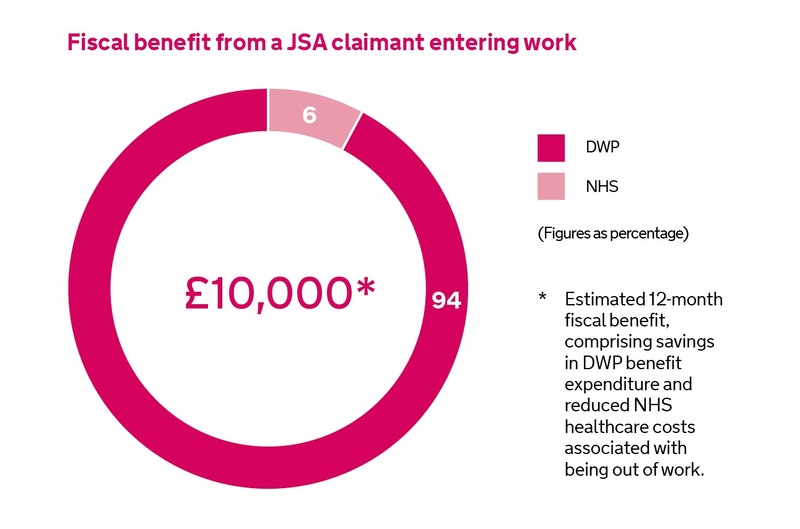 For example, in Manchester, the number of individuals claiming out of work benefits has remained stubbornly high. It is roughly half of all people out of work in the area and costs taxpayers roughly £1.4 billion a year. The authority wanted to understand the impact of supporting long-term claimants with a more holistic approach to getting them into work. Its Working Well programme provides a key worker who puts in place an integrated package of support including health, skills, debt advice and housing. Using the new CBA Toolkit, Greater Manchester was able to make the case for a £15m investment in the programme, jointly funded between local partners and the Department of Work and Pensions (DWP). The investment enabled the authority to pilot the approach with 5,000 Employment and Support Allowance (ESA) claimants across the area, and the decision to invest was heavily influenced by the estimated breakdown of benefits among the partners involved. As this example demonstrates, having access to consistent cost data enables local authorities to understand the fiscal, economic and social impacts when appraising public service transformation proposals. It goes further, too, in helping cities and local authorities quantify the impact on different agency budgets and estimate the benefits of commissioning services jointly. This can unlock opportunities for joint investment with new partners who may not otherwise have been identified as beneficiaries. Of course, CBA is used by governments across the world to estimate the costs and benefits of spending options and to assess the relative merits of alternative policies. The Green Book, soon to be refreshed by HM Treasury (HMT), sets out the broad principles of CBA. However, there is no guide that can be easily applied by practitioners working directly on service delivery. The building blocks of the CBA tool are shown below. do the proposed interventions provide value for money relative to business as usual and what is the payback period for the project? by investing in a preventative approach, can local partners reduce the levels of need and therefore budgets in the medium to long-term? where an agency invests in a programme, to what extent are other agencies or departments likely to benefit? A range of agencies stand to benefit from a tool that enables them to answer such questions. 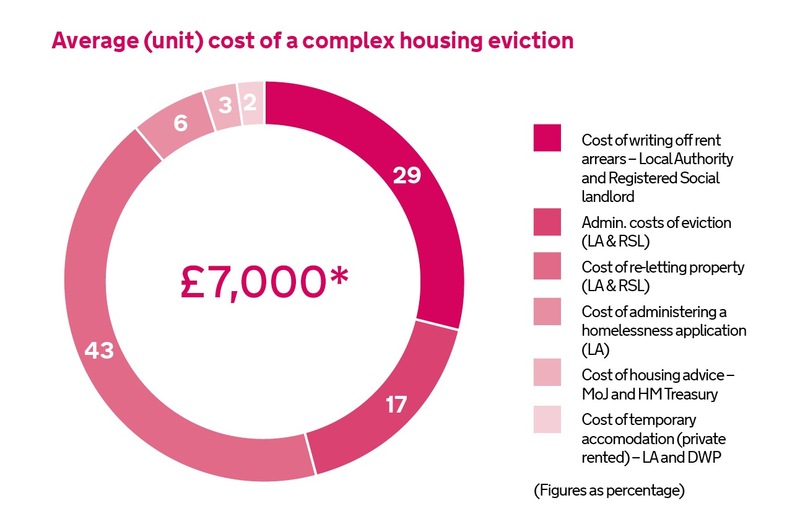 One way in which the CBA tool could be used is to show the distribution of the cost of a complex housing eviction across a number of agencies, or the fiscal benefit of getting a Jobseekers Allowance claimant back into work. The CBA guidance in the toolkit has also been added to the Green Book series so has the backing of HMT as a robust approach. The unit cost database now contains more than 600 unit cost estimates. All of these can be used to calculate the costs of delivering proactive services and the potential savings in reactive costs that can be achieved. Reactive costs are those incurred when services have to respond to problems, as opposed to intervening before a crisis occurs (i.e. proactive or early intervention services). This standardised and common set of estimates accelerates the process of assessing spending proposals, saving time and money for HMT. Equally important, the database shows the constituent cost estimates and the sources upon which they are based, enabling organisations to understand the quality of the evidence underpinning the cost estimates and providing a basis for challenging them. In Greater Manchester, for example, the authority was able to estimate the value for money in expanding a programme to reduce re-offending among young offenders. 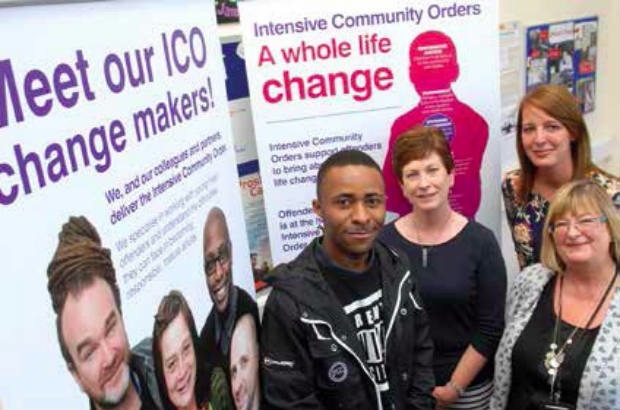 The Intensive Community Order targets young males with custodial sentences of less than 12 months, combining community restitution with training. The CBA tool estimated that the expected fiscal benefits of the programme were £14 per every pound spent on reducing reoffending. Of these benefits, it estimated that, once at scale, up to £8 per every pound spent could be cashable, or lead to taking money out of the budget – supporting the decision to scale up the programme across the whole of Greater Manchester. There are 2 approaches to estimating unit costs: top-down and bottom-up. The top-down approach is based on a simple calculation: divide total expenditure for a programme or policy by total units of activity to derive a unit cost. The units of activity are specific to the services that are being costed, for example, the cost of a prison place or GP consultation. Typically this approach uses aggregate, budgetary data to estimate a unit cost. Imagine, however, if you could go one step further and trace those costs to the intensity and duration of services provided to a range of people with different levels of need. 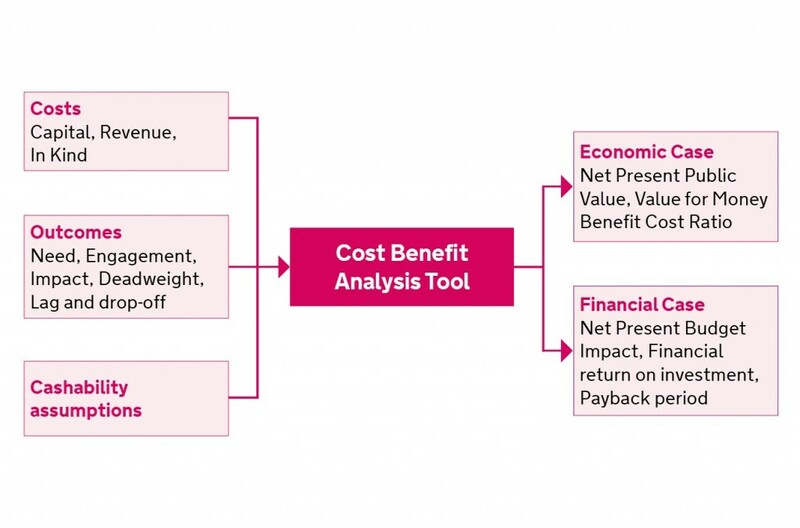 This would allow you to disaggregate the costs of a service so that you could see variation in costs and begin to understand why some service users cost significantly more than others. This bottomup approach provides a greater level of granularity than the top-down method but it requires (more) robust cost data. It involves identifying all of the resources that are used to provide a service and assigning a value to each of those resources. These values are summed and linked to a unit of activity to derive a total unit cost. Seeing the difference these tools have made to projects like those in Manchester and other local areas, we now want them to become mainstream. We have provided training for local public bodies and also required the tool be used in service reform proposals for the Troubled Families programme and the Transformation Challenge Award. The uptake has been extremely encouraging: almost 120 local areas bidding for the Challenge Award and at least 60 local authority and voluntary organisation bidders for the Our Place programme are expected to use the tools. The next challenge is to ensure that the toolkit becomes the standardised approach for developing spending proposals across a range of services and in doing so helps catalyse partnerships between public, private and voluntary agencies. Access the toolkit here and let us know your feedback. ... but where is access to the tool kit? You can then download the tool by clicking on the 'Download GM CBA Tool v4.1', which is on the right of the screen.